-bigger supermarkets, like Meny and Centra,probably Ultra too, have their own gluten free section. Smaller supermarkets, like RIMI, might have frozen gluten free bread. -health food stores, like Life and Sunkost, have some products. Brands: Semper, Schar, Føniks bakeri etc. -most Indian and Thai restaurants have a gluten free menu. Well, I am only intolerant to gluten, so can't say if it is totally clean. -Peppes, Dolly Dimple, Olivia and Pizzabaronen do gluten free pizza. Both McDonalds and Burger King have gluten free bread. -In Oslo, there is a gluten free bakery, Bakefri. They are in Kirkegata, downtown. 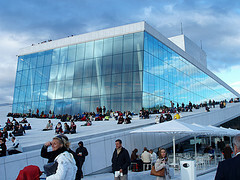 -For Oslo, there is a list of gluten free restaurants at glutenfri.org. To get in touch with other celiacs, the best way is on Facebook. The Norwegian association of celiacs have a group there, Norsk Cøliakiforening-NCF. The group has over 2000 members, eager to help each other out. That was how I got to this page, by posting on this page. Within 24 hours I got three replies to my question on gluten free in Palma, Mallorca. Most Norwegian have a good level of English, so a foreign poster will probably get a good reply. The Norwegian association is at www.ncf.no. Unfortunately, most info in Norwegian. Their section (You get to it by clicking on Glutenfri mat on the front page), Glutenfrie Norge features a list of gluten free restaurants and hotels. Just point at the map, info shows up. Plus, of course, we have the Norwegian Gluten Free Restaurant Card.